Looking around my kitchen yesterday, bread pans, bench scraper, and bowls sitting on the drying rack, flour seeping slowly into the every nook and cranny, freezer increasingly full of various foil-wrapped loaves, I realized that my apartment is becoming a de facto part-time bakery. And I’m fine with that; I probably spend as much time in the kitchen as I do in my bed. I can already tell that in the last couple of weeks, I’ve improved my bread-making skills. Look out – by the end of the year, there’ll be another Nancy Silverton around! Now, I had been pretty confident of my dough-wrangling abilities. After all, I’ve been making bread for years, and I’ve been through culinary school (lah-tee-dah)! But the truth is, this recipe gave me some problems. Not so much in the mixing or fermentation, but in the makeup. 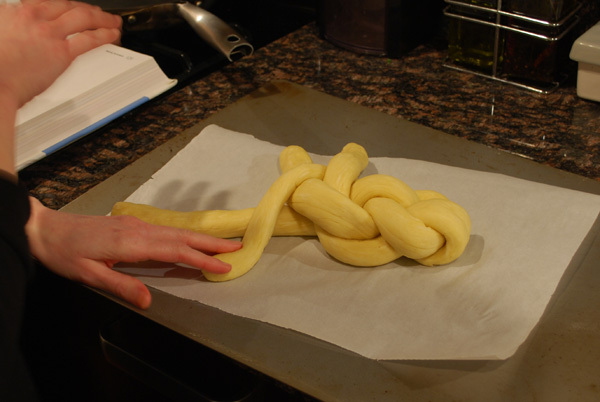 This is a braided dough; and if you’ve ever, um, been a girl, then you’ve surely braided hair once or twice. It’s just about the same thing, except that the dough isn’t attached to anyone’s head. My problem, though, came from the fact that this recipe calls for the dough to be split into two pieces, not three. I figured, how hard could it be? Well, when it’s late, and you’re trying to move quickly, it can be plenty hard. I think I braided and un-braided about ten times. Finally, I got out two reference books, and pretty much figured it out. But even if it didn’t turn out textbook-perfect, it looks good enough to me. 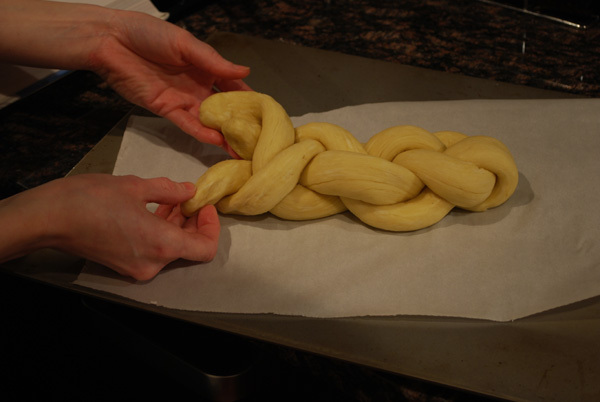 I’m including pictures of the braiding process below, so hopefully that will help you. If you just can’t be bothered, then a three-strand braid is fine; it may just end up a little shorter than the two-strand. 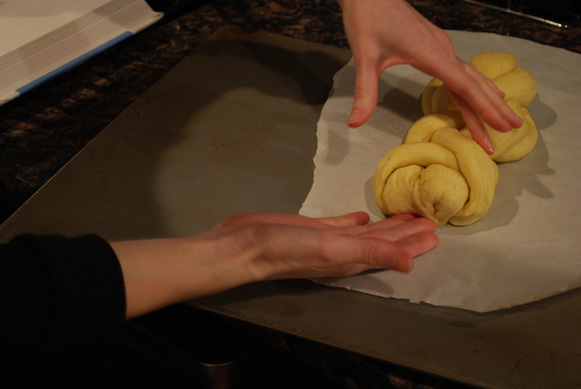 You can roll the dough to thinner strands, but you’ll probably have to cover them and let them rest for about 5 minutes after rolling to a certain point. The gluten gets all worked up, and you just have to let it relax for a bit before it will play nice. So how does this bread relate to the theme I’ve set for myself this week (similar ingredients, different end results)? True, there’s only 2 tablespoons of water in this recipe, compared to over 1 cup for the others; but the difference is made up with sour cream. Yes, sour cream obviously has a different flavor than water, and that is a large reason it’s in the recipe; but the fat in it is crucial here, as is the additional butter added to the dough. The reason behind all this is what I’ve been harping on all week: gluten. 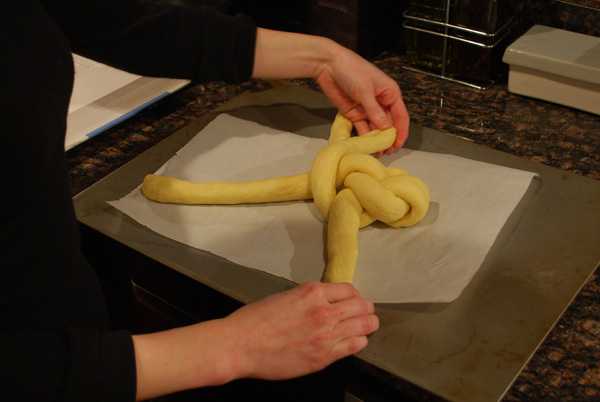 Gluten forms whenever you handle dough: through kneading, cutting, shaping, rolling, and especially braiding. 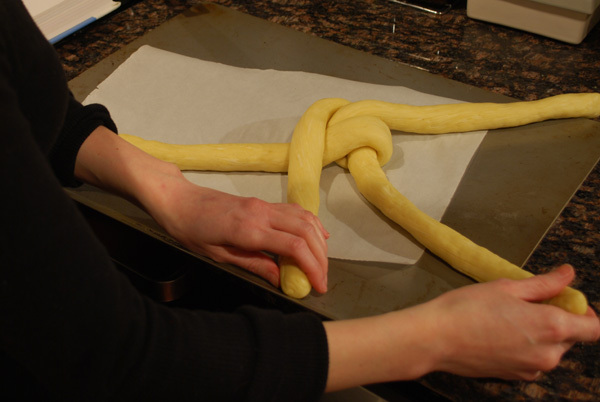 If you took a basic four-ingredient dough (flour, water, salt, and yeast) and braided it, it would be tough as all get out, because the gluten would be so over-produced by all the handling. 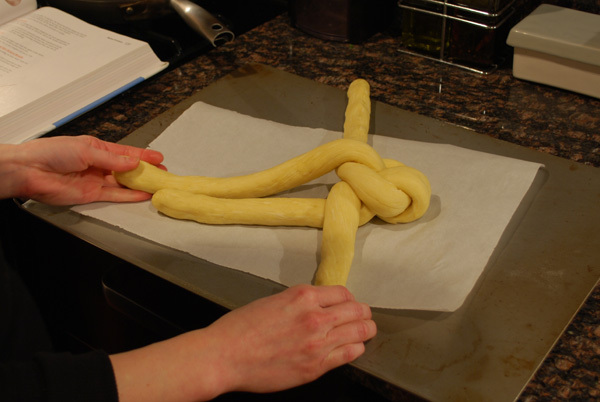 The role of fat in a bread dough is to shorten the strands of gluten – hence the term “shortening”. If gluten strands are like teenagers trying to just all hold hands and enjoy a quiet moment together, fat is like the chaperone wedging itself in between, smacking their hands apart. Any fat will do the job, from olive oil to butter to sour cream. 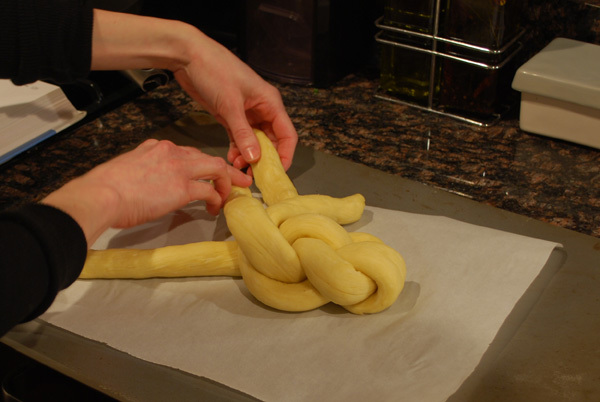 When you braid bread, you need that shortening action to keep your bread tender, and edible. So, ok. This recipe isn’t exactly the same as the others, but it is a different and interesting shape. This is nearly as basic as a braided recipe gets (yeah, I cheated a little with the sour cream, but let’s not get stuck on details). 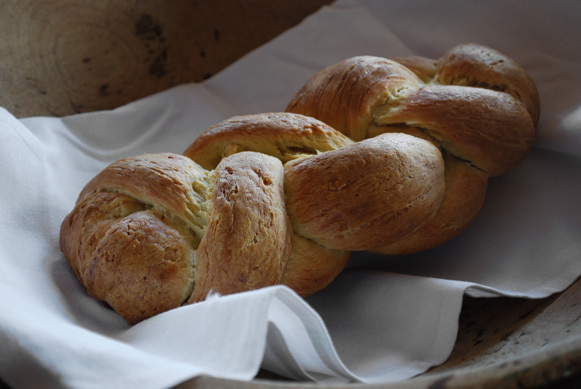 Not many people in America make braided breads, as they’re mostly common in Switzerland and Germany, so they usually impress. 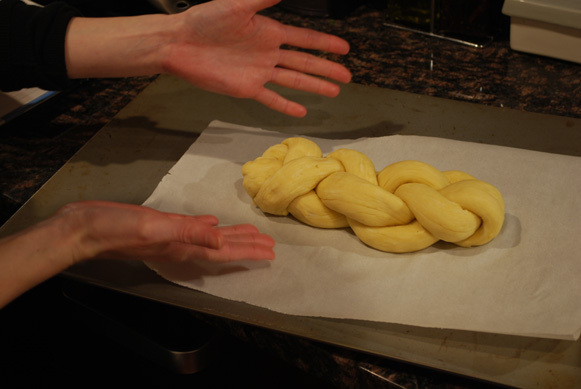 And who doesn’t like to pull apart a soft braid into tiny bite-sized pieces? It’s so tactile and satisfying! 1. Grease a sheet tray, or line it with parchment. Mix the water and the yeast together until dissolved. Gently warm the sour cream in a small pan until it reaches about 105 degrees F (no hotter than 110!). Add to the yeast mixture and mix together. Add beaten egg. 2. Sift or whisk the flour and salt together into a large bowl, and make a well in the middle. 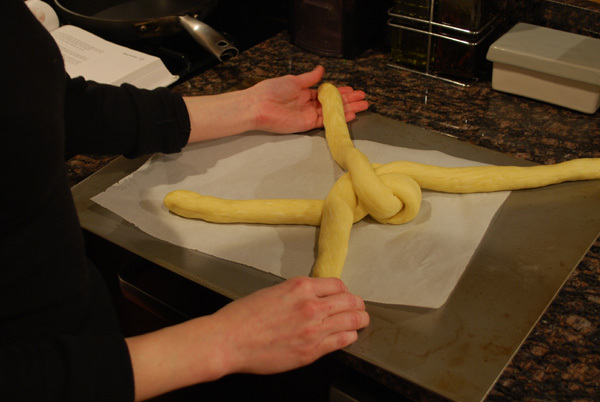 Add the yeast mixture and gradually mix to a dough. Beat in the softened butter. 3. 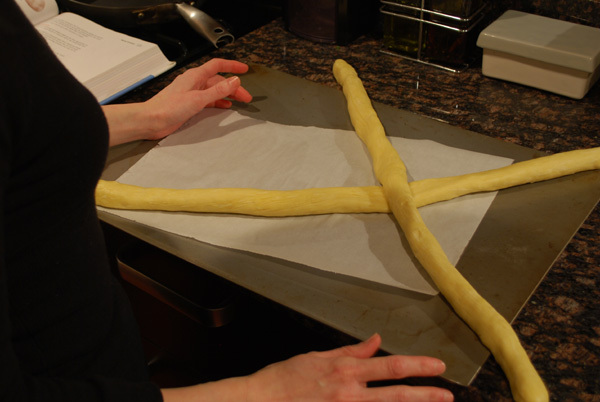 Turn out onto a lightly floured surface and knead for about 5 minutes, until smooth and elastic. Place in a lightly oiled bowl, cover with oiled plastic wrap, and leave in a warm place for about 1 1/2 hours, or until doubled in size. 4. Turn out onto a lightly floured surface and punch down gently. 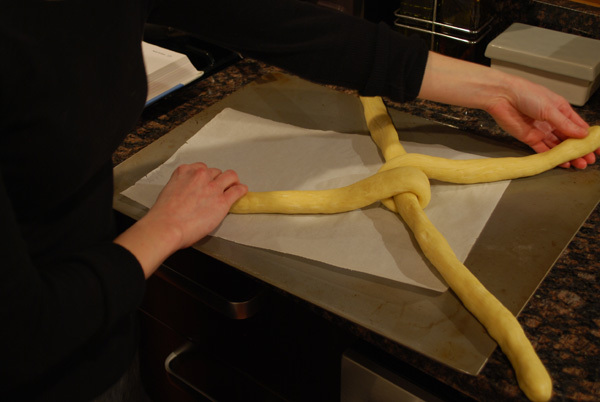 Cut in half and shape each piece of dough into a long rope, about 14 inches in length. 5. 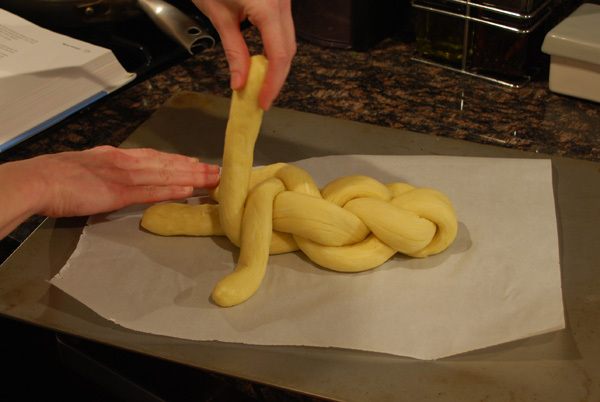 To make the braid, place the two pieces of dough in a wide X-shape in front of you on the prepared pan. Pick up the ends of the bottom string and move them straight across the other string so that they change sides but do not cross each other. Repeat the procedure with the other string, and repeat until the braid is finished. 7. Cover with lightly oiled plastic wrap and leave to rise in a warm place for about 40 minutes. 8. Meanwhile, preheat the oven to 375 degrees F. Mix the egg yolk and water for the glaze, and brush over the loaf. Bake for 30-35 minutes, or until golden. Cool on a wire rack. 1. 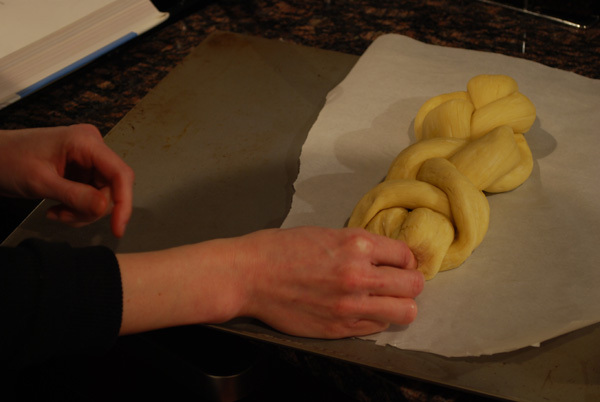 If your dough shrinks a little after braiding, cover it and give it a five minute cat-nap, then gently lift and pull the ends a bit to lengthen the loaf. Don’t tug! 2. After brushing with the egg wash, prior to baking you can sprinkle the braid with poppy seeds or sesame seeds for a little extra decoration. 3. 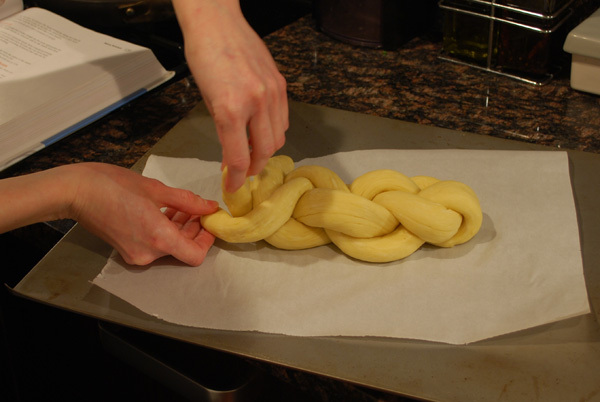 A suggestion from Bo Friberg, author of the highly excellent book, The Professional Pastry Chef: Brush the braid with egg wash and proof a little less than specified. Egg wash the braid a second time, then place the sheet pan in the freezer long enough for the loaves to become firm on the outside, 15 – 20 minutes. Bake directly from the freezer. The temperature change from the freezer to the hot oven, combined with the under proofing, makes the bread develop more oven-spring. This shows up between the strings as a lighter-colored area (without egg wash) and gives the pattern more definition. 4. If you’re looking for something more showstopping, try braiding together white and whole-wheat breads. The contrast is very pretty, and gives everyone at the table their preferred choice of bread.